The prestigious University of Southern California is a private research university located in the heart of Los Angeles on a beautiful 226-acre campus. USC is a large school home to 19,000 undergraduates and close to 25, 000 graduate students. USC Village, a brand new residential and retail complex directly north of campus just opened this August, serving as a town center for all students. School spirit runs high and game days supporting the beloved Trojans are legendary. 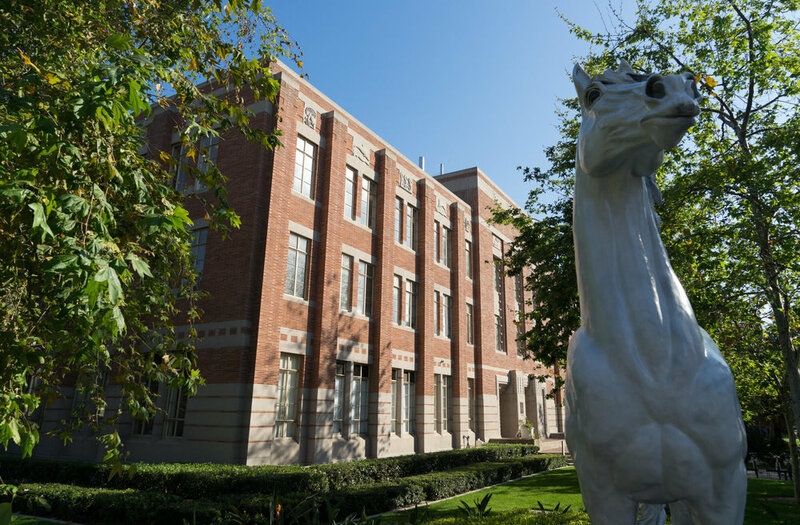 USC is close to Downtown LA, once rundown, but in the midst of a renewal and resurgence, emerging as a new cultural center of the city. This guide centers around campus and downtown, for more itineraries around greater Los Angeles, see below. Transportation: The nearest major airport is Los Angeles International Airport. LAX is 16 miles from the center of USC. The campus is within minutes of Los Angeles’ city center and the Downtown Arts and Education Corridor, easy to reach by major freeways as well as L.A. Metro buses and Metrolink rail. Stay: Los Angeles has notoriously bad traffic, so we suggest you stay near USC, a 5-mile trip can easily take over a half hour depending on the day and route. Across the street from the USC campus check into the Radisson, it’s the most convenient option especially if you have an early morning tour. Downtown Los Angeles is a 10-minute drive from USC. Many families choose to stay at the Omni Los Angeles, Doubletree by Hilton, The Ritz Carlton or the JW Marriott. Channeling your inner hipster, book a room at the trendy Ace Hotel in the historic United Artists building with a killer rooftop bar. Coffee: USC is an urban campus, and the major chains have cafes right on the grounds. Popular Coffee Bean and Tea Leaf have two locations: in the Campus Center and at the Lucas School of Cinematic Arts. Starbucks at the Trojan Grounds is open 24/7, offering grab and go meals plus snacks - it’s a gathering place for students and an excellent place to observe campus life. Breakfast: Close to campus, everyone’s favorite is Natures Brew, a counter service café with solid food, juices, and smoothies. Students rave about the pancakes and omelets at nearby Jacks 'N Joe, serving breakfast all day. Located downtown, The Original Pantry is an LA institution, a diner dating back to 1924, open 24/7. Another student favorite is Roscoe's Chicken and Waffles. Lunch: Head to the Ronald Tutor Campus Center where students flock for healthy fare to LA’s popular mini-chain Lemonade. Other choices include Seeds, Verde or California Pizza Kitchen. Mingle with the students at Gastropub Study Hall, a few blocks from campus; it’s a homey neighborhood spot near Fraternity Row. Chichen Itza in the Mercado la Paloma, a colorful multicultural marketplace just east of campus, has legions of fans among students and LA foodies alike, famous for its Cochinita Pibil. Their new market stand, Holbox, specializing in Yucatan-style seafood has the critics drooling over their ceviche tostadas, lobster tacos, and yellowtail chile rellenos. Downtown’s Grand Central Market, dating back to 1917, is now an impressive 30,000 square foot food emporium and marketplace. It’s hard to choose between Eggslut, Belcampo Meat Co., Sticky Rice LA, Madcapra, Tacos Tumbras and Wexler’s Deli--go hungry! Have a coffee at G and B before you leave. Casual: Bacaro, a cozy wine bar with a tapas-centric menu, may just be every USC student’s favorite, located right near the sororities and fraternities. Students head here at happy hour and on the weekends for boozy brunches with bottomless Sangria, Mimosas, and Bloody Marys. It’s hand rolls only at downtown’s Kazu Nori, close to the Expo Metro Line, from chef Kazunori Nozawa of the hot mini-chain Sugarfish, also located nearby and another excellent choice. Chef Josef Centeno of Tex-Mex Bar Ama and Baco Mercat was one of the early pioneers of downtown’s culinary resurgence. His newest restaurant, P.Y.T. shines with a veggie-centric menu while Centeno's Ledlow is an all-day spot perfect for a bite at breakfast, lunch or dinner. Red Bird housed in a beautiful old rectory showcases an innovative New American menu plus an awesome bar serving creative cocktails. A Step Up: Considered one of LA’s best restaurants; book way in advance to get a table at trendy Italian Bestia, an impossible reservation due to a combination of excellent food served in a buzzy industrial space. In the mood for modern, upscale Mexican head to newcomer Broken Spanish. Mixing Japanese and Italian, Orsa and Winston is chef Centeno’s upscale neighborhood restaurant garnering much acclaim. Inspired by Chef Steve Samson's Bolognese nonna (grandmother) Rossoblu opened this past June serving upscale Italian in a big, glitzy, stunning space with both indoor and outdoor seating. Don't think the minestra nel sacco is just another chicken soup; this is a must order, a typical dish from Bologna elevated by a chef at the top of his game. Late Night Snack: Students love Cream’s handmade ice cream sandwiches and cookies; it’s close to campus and open till midnight. Local Attractions: Downtown, The Broad, a contemporary art museum from philanthropist Eli and Edythe Broad made quite the splash when it opened in 2015. The 120,000 foot, $140 million building is home to the Broad’s personal art collection, displayed in a striking building designed by Diller Scofidio + Renfro. The restaurant Otium, adjacent to the museum from former French Laundry chef Timothy Hollingsworth, has been garnering great buzz as well. Next door, the Walt Disney Concert Hall designed by Frank Gehry is an architectural marvel. Catch a performance, take a docent or self-guided audio tour, wander the rooftop garden or stroll along the buildings exterior walkways. Check what’s happening at Grand Central Market, in addition to all the great food, there are also festivals, live music, and outdoor movie screenings. The Expo Line (a light rail system) connects USC to stops such as Downtown, Santa Monica, Culver City and Union Station, making exploring the city easily accessible to students and visitors alike. Just toured the University of Southern California Campus? Are you a University of Southern California student, parent or Alumni? Fill out this 2 minute survey to supplement our Daytripper University Guide for University of Southern California!